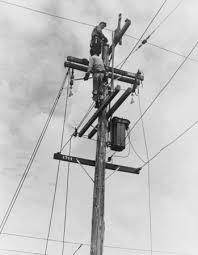 In the late 1930s the government was ready to launch the Rural Electrification Scheme. The outbreak of the Second World War in 1939 caused a setback and the programme was postponed until 1946. Steady progress was made from then on through the 1950s but there were often budget cuts to be dealt wit back then also from time to time so progress might not always be as fast as was hoped. Work speeded up again in 1962 and by 1965 some 80% of rural households were connected but many people remember well the outlying communities that were not connected until the mid 1970s. Indeed it was 2003 before the remaining rural places – Inishturbot and Inishturk (off the westcoast) were finally connected to the mains but some islands still generate with an off-grid supply. 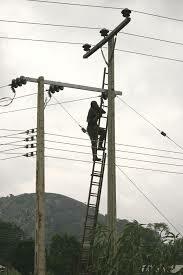 The coming of electricity was to become the most technological innovation to impact the countryside. It did not happen overnight or even too quickly after that – it took many, many years for the rural community of this area to really feel and experience the life changing event that was rural electrification. The reasons were many. Firstly it was down to affordability. A new household bill was generated that was never around before. Up until now the major “must pay” bills in any house in this area was the rent and the rates and non payment of these meant you were put out on the road – no if’s or but’s …… and no pleading, protesting or government intervention would save you. The one fear that every household in the area had, was the fear that they might not be in a position to pay these two bills and it was a constant worry in these days. Now there was another new bill that had to be paid and it was putting more pressure on the household purse. Next it was dangerous. People were sceptical and afraid of this new stuff that you could not see. This electricity could kill you. It could burn down your house. Some people were terrified of it and older people were reluctant to allow it in to the house or as they would say “inside the gate”. In the beginning it was only for light. People had no electric appliances nor the money to buy them. The first houses I can remember had one light installed in each room and maybe one socket in the kitchen. That was it. The first items that most people acquired after the installation were an electric kettle and an iron. Sometimes a relation coming from England on holiday would bring one of these items home as a gift to their parents. It was many years later that washing machines, televisions, fridges and cookers came along. Computers, TV Games, Videos, Hair Dryers, Toasters, Food Mixers, Blenders and vacuum cleaners were still a long way off – remember the house had only one socket. Generally people were un-educated on its use and benefits. After the first lights were turned on one woman was heard to complain that “it showed up too much dirt around the house at night when visitors came in”. Another was asked how she liked it and replied that it was great to be able to turn it on while she searched the house for a candle. One local man used to screw out the fuse to turn off the light as nobody showed him what the switch was for. Lighting was not installed in sheds in those times and outside lights were few and far between and if they were there they were only turned on when somebody was outside and were switched off again. A local man maintained that there was no earthly reason why he should be giving light to the rest of the neighbours to see their way around outside and he paying for it. Nothing was wasted. I remember the electricity being connected to Garbally School in 1967 and then only three lights were put in – one in each classroom. No power points or sockets were installed at that time. Like it or not, the life of many households was transformed and the overall social effects cannot be overstated. The countryside became literally brighter and the residual belief in fairies and ghosts which once had such a powerful grip on the people of the area was increasingly banished. A chink began to appear in the armour of all sorts of supernatural belief. Local industry was now being generated and powered machinery was making work less and less labour intensive and, of course, everything did not have to grind to a halt at the coming of darkness. lovely to read this account and including the stories also makes it more interesting.